A watershed moment for this vet? T-RackS 5’s new effects, metering and Album Assembly window are ace, and at last it all looks as good as it sounds. Still a fantastic collection of effects! Chain View has a lot of dead space. Shell still doesn’t have a gain control! The original in-the-box mastering solution, T-RackS has ballooned over the years from its early remit as a fixed processing rack into a comprehensive ‘pick and mix’ smorgasbord of effects for every stage of the music production process, taking in a broad array of classic emulations and all-new devices. Modules can be used in the standalone T-RackS shell application or loaded as plugins (individually or within the plugin version of the T-RackS shell) in any VST/ AU/AAX-compatible DAW or audio editor. With the latest full version update, T-RackS 5, IK has put its development time into modernising the GUI, expanding the metering options, and extending the workflow all the way up to exporting your final album in three mastering-friendly formats. It also adds four new processing modules to the library (bringing the total available up to an impressive 38), all of which are included with all three versions of the software. Taking those into account, the regular T-RackS 5 (€180) includes nine modules, T-RackS 5 Deluxe (€360) packs in 22, and T-RackS 5 MAX (€600) lands you the full library of 38. The standard and Deluxe module line-ups are fixed, alas (see the IK website for the run-down), but you can add to them at any time by clicking the ‘shopping trolley’ button to launch the Custom Shop, where all those tempting processors that you don’t already own can be bought individually or in bundles. T-RackS 5’s reborn shell application GUI makes the cramped, semi-skeumorphic visage and clunky interactions of previous incarnations seem positively ancient. The new look speaks for itself, and we can’t imagine anyone not preferring it, but it’s the functional benefits of the interface that are most welcome. Now, rather than loading modules into the Chain from a row of menus at the top, you pull them directly in from a filterable graphical browser panel, and reorder them by dragging - up to 16 of them, double the previous limit of eight. And the Chain and currently selected module are now housed in separate panels, so you don’t have to constantly flip between them any more. The whole interface is freely scalable all the way up to full-screen mode, and each panel (preset and module browsers, Metering, Chain, Clip List, etc) can be resized within it, most of them scaling their contents to fit. This new-found elasticity proves most useful with regard to the module panel, meters and Waveform View, all of which resize beautifully. You can’t completely hide panels, which is a shame, but you can now resize the module plugins, which is good news for users of Retina/HiDPI displays. The Metering section has also been rebuilt from the ground up. It now features Peak, RMS, LUFS and Dynamic Range meters, a Spectrogram, a Spectral Analyzer, and Phase and correlation meters, all with plenty of configuration options including support for a wealth of industry reference standards. The whole lot can also be duplicated in a separate scalable window, complete with additional Left/Right and Mid/ Sides VU/PPM meters. T-RackS 5’s new Master Match module is a matching EQ and dynamics processor that enables a frequency curve and RMS profile to be extracted from up to three reference tracks (in full or selected sections of each) and applied to your mix. That mix can be a stereo WAV in the standalone version, or the master bus of your DAW project when deployed as a plugin. Using Master Match is a three-stage process. First, click the Learn Reference button to pull the frequency response curve out of your reference tracks. Then, click Learn Source and play your source track or project back for as long as you like. Finally, click Match to have the module apply the reference EQ curve to your track and automatically set the Spectral Matching and RMS Matching depth sliders for what it considers to be optimum results. You can set upper and lower frequency limits to focus the processing on a particular range, click in up to eight parametric EQ filters for manual editing, and switch between ‘smooth’ and ‘sharp’ matching. Master Match works well enough, but as with all matching EQs, the curves it comes up with should be taken as suggestions and tweaked to taste - it isn’t, of course, the world’s first fully automatic mastering engineer. The four new modules (one of which is covered in Game, Set and Master Match) are all solid additions to the roster. One is a channel strip, comprising compressor, EQ, exciter, low-end enhancer and limiter, presented as a set of ‘macro’ controls, each of which adjusts various behind-the-scenes settings. The EQ section, for example, consists of Air, Focus and Body knobs, while compression and limiting are dialled in with Push and Volume. Valve-style saturation is on tap via the Analog knob; Bass Punch and Transients tighten up the bottom end and emphasise/deemphasise attack transients respectively; and the Width knob narrows or widens the stereo image. It sounds fantastic and gives the newcomer to mastering an intuitive assisted processing solution, but it’s not going to be anyone’s first choice for detailed sculpting. Dyna-Mu is an emulation of the Manley Variable MU compressor. IK describe it as “indistinguishable from the hardware”, and it does sounds absolutely lovely, oozing warmth, musicality and working wonders on drum overheads and the master bus. Finally, EQual is a flexible ten-band parametric equaliser. Every band can be set to one of nine filter types (high-pass, low-pass, shelf, bell, tilt, etc), each one offering up to ten circuit modelling options, including a variety of Neve, SSL and API emulations. It’s s a versatile hybrid EQ for both mixing and mastering. 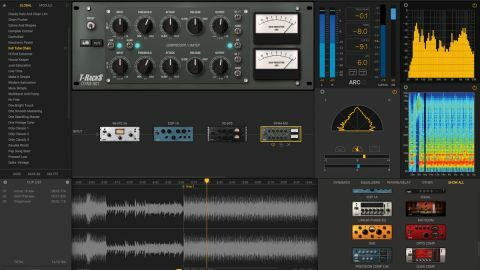 T-RackS 5’s interface is a night-and-day improvement, the change reminding us of Superior Drummer 3’s joyous metamorphosis; and the Metering section is a major step up, too. Those alone give the whole thing the sheen and excitement factor of a whole new application, but the four new processors also play their part - particularly Dyna-Mu - and Album Assembly is simple but effective. This is a transformative update, making IK’s professional effects suite feel more relevant and capable than ever.